Kenny Kellogg: Best DVD Ever? Most of you know that I'm prone to hyperbole (and misspellings). "Best Song Ever", "Best Class Ever," and "Coolest Company Ever" come out of my mouth regularly. What can I say, I'm an excitable guy. So I'm introducing my new recommendation service. When I think there is something you should check out, it will be dubbed, "Best ___ Ever." 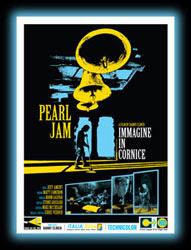 Kicking off this series is the new Pearl Jam DVD, Immagine in Cornice. It's the Best DVD Ever. Here's a little slice of what you get. Ahh, PJ, get's me fired up. The background is they brought an artsy Italian director to film their 5 shows in Italy last year. Scotty, my brother and I went to a private screening SF on Monday. Ok, it wasn't private, but we did watch it in an actual movie theatre with actual people. The highlights were a great Alive, Rocking in the Free World (shot in an awesome Italian courtyard) and Scotty's personal favorite, Come Back. Here is another video sample, from Alive. You can buy the DVD here and mine is on the way. Because this is the Best DVD Ever, I'm going to give you a bonus treat. Here is a cool clip from the Best DVD Ever. Eddie and Mike are playing a little known song off of Vitalogy called Lukin. It's meant to be played as loud and fast as possible and they do just that. It's lyrics are obscured by Eddie but they're pretty interesting. Lukin is one of his bud's and he is trying to get over to his place, but get's harassed. Enjoy the Best DVD Ever.